For more than 35 years, planners have depended on The Planner's Use of Information to help them address their information needs. While the ability to manage complex information skillfully remains central to the practice of planning, the variety and quantity of information have ballooned in the last two decades. The methods of accessing and handling information– although often ultimately easier and faster– require new technical savvy. At the same time, planners themselves, and the constituents they serve, have changed. 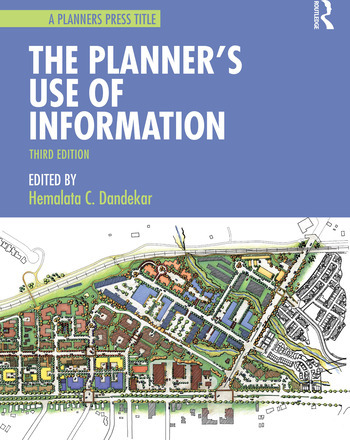 This completely revised and updated third edition of this popular book will serve the new generation of planners who work in a world where social media, cell phones, community embedded development, and a changing population have revolutionized the practice of planning. Edited again by Hemalata C. Dandekar, with chapters by leading experts in data collection, analysis, presentation, and management, The Planner's Use of Information empowers practitioners to use and address the impacts of twenty-first century technologies. The Planner's Use of Information offers a range of methods for addressing many kinds of information needs in myriad situations. It's an invaluable day-to-day resource for practicing planners and an ideal classroom text for courses in planning communication and analytical methods. Illustrations, real-life examples, cartoons, exercises, bibliographies, and lists of online resources enrich the text. Hemalata C. Dandekar, PhD is Professor and former Department Head of City and Regional Planning, California Polytechnic State University, a City of San Luis Obispo Planning Commissioner, and a licensed architect in California. Her scholarly works include books and articles on planning methods, housing, urbanization, rural and international development. She is Professor Emerita, University of Michigan and Arizona State University where she was Director, School of Planning and Landscape Architecture.